On behalf of the entire team at Halton Roller Hockey let me take this opportunity to convey our best wishes for a healthy and prosperous 2019. We hope that you've had a great holiday season and that you’re all back into your regular routine. 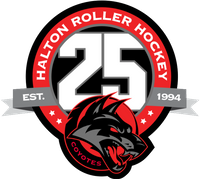 It’s the time of year where the team at Halton Roller starts preparing for the new season and we are really excited about the upcoming year. This season we will be celebrating our 25th anniversary and we have many exciting things planned. Stay tuned as we will be releasing important information throughout the upcoming weeks about our season. Our season starts the week of April 8th. We are capping the teams in the 8U and older divisions at 10 skaters. We are introducing a Girls Only division. Blades and Wheels camp will be held the week of July 8th. Ideally team rosters will be completed by March 25th. New jerseys and league logo designs introduced. Registration has been open since US Thanksgiving and many of you took advantage of our promotion during our Black Friday event. Since that time registrations have been coming in fairly steadily. Last years registrations grew by 27% and based on registrations and enquires so far we are anticipating an even larger growth this year. So we urge you to go register asap as spots are filling up quickly..
Maplegrove Arena 2237 Devon Rd Oakville, Saturday’s Jan 19th and 26th. Along with Saturday’s February 2nd and 9th all from 11:00am to 2:00pm. "The Fastest Game on Wheels" . So we urge you to go register asap as spots will be filling up quickly.